On January 15th, 1967... the Green Bay Packers defeated the Kansas City Chiefs in the very firstSuper Bowl. This game took place five years before I was born, yet it's a very important part of who I am as a football fan. The story begins in Hawaii where both of my parents were born and raised. In the mid50's, they moved to Wisconsin to go to college where they eventually met, got married, and started a family. That's where and when they became Green Bay Packersfans. After my father graduated from Milwaukee School of Engineering, he started working for Honeywell and moved the family out to Florida. Eventually he was assigned to work on a project involving the SR-71 Blackbird, so they came out to Southern California where my parents attendedSuper Bowl I and had the opportunity to cheer on their very own Green Bay Packers. When the moved to Northern California in the early70's, the San Francisco 49ers became their favorite team and for as long as I can remember they've been one of my least favorite teams. However the Green Bay Packers have always been a happy medium where we could all sit around and cheer on the same team. The older I get, the more nostalgic I become. The Lombardiyears were a little before my time, however it doesn't mean that I can't collect the guysmy parents cheered for. 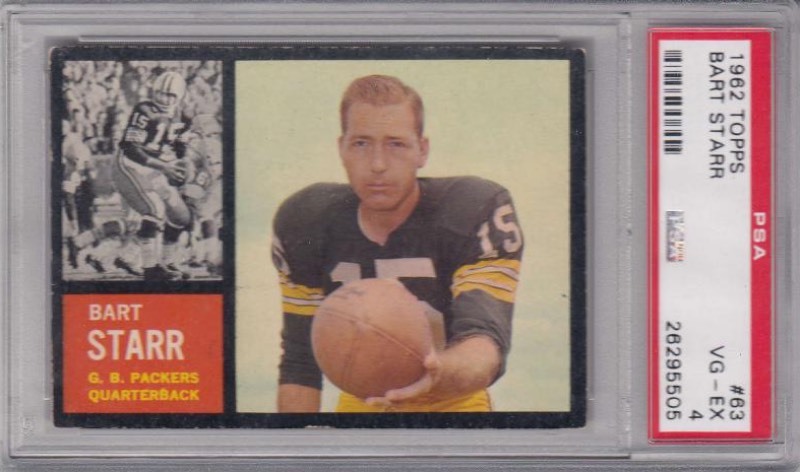 Bart Starr was one of my father's favorite players back in the day and the 1962 Toppsfootball card design is one of my personal favorites. Thanks to a best offer option and a $10off coupon, I was able to grab this card off of eBay for $25shipped and finally cross this card off of my wantlist. I realize that there might be a point in my life where I won't be able to hold onto everyone of my treasured collectibles. However... like my 1956 Topps Jackie Robinson and my 1983 Topps Tony Gwynn, I hope that this card is with me until the very end, because it's more than just a piece of cardboard. It's a connection between me and my parents. Have you ever purchased a card because it reminds you of someone special? Well... that's it for today. Happy Super Bowl Sunday and sayonara!